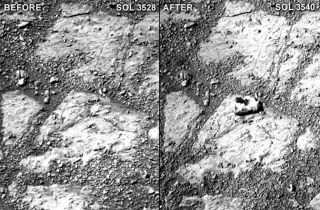 In a comparison of recent photographs captured by the rover’s panoramic camera, or Pancam, on sol 3528 of the mission, only bare bedrock can be seen. But on sol 3540, a fist-sized rock had appeared (raw Pancam images can be found in the mission archive). MER scientists promptly nicknamed the object “Pinnacle Island." "It's about the size of a jelly doughnut," Squyres told Discovery News. "It was a total surprise, we were like 'wait a second, that wasn't there before, it can't be right. Oh my god! It wasn't there before!’ We were absolutely startled." teve Squyres discusses the gypsum vein discovered by Mars rover Opportunity, another piece of the Martian water puzzle. "So my best guess for this rock … is that it's something that was nearby," said Squyres. "I must stress that I’m guessing now, but I think it happened when the rover did a turn in place a meter or two from where this rock now lies." Never missing a scientific opportunity, Opportunity scientists hope to study the bright rock. “It obligingly turned upside down, so we’re seeing a side that hasn’t seen the Martian atmosphere in billions of years and there it is for us to investigate. It’s just a stroke of luck,” he said. Opportunity has outlived its 3-month primary missionby ten years, notching up nearly 23 miles on the odometer so far. Sister rover Spirit succumbed to the Martian elements in 2009 when it became stuck in a sand trap in Gusev Crater. Spirit’s mission was declared lost when it stopped transmitting in March 2010, likely drained of energy. Although Spirit had the rougher time on Mars and was the first to die, it was also a huge success, aiding our understanding of Mars' geological history and outliving its warranty by 5 years. But now it's just Opportunity and Mars' new arrival Curiosity that soldier on to reveal more than we ever dreamed about our neighboring Red Planet.